WASHINGTON — President Trump demanded on Tuesday that a freshman lawmaker from Minnesota resign after she posted tweets deemed anti-Semitic even by fellow Democrats, but those tweets echoed some of the same insinuations about Jews and money that he has trafficked in for years, as a candidate and president. Mr. Trump rejected the apology of Representative Ilhan Omar, one of the first two Muslim women elected to Congress, saying, “it was lame, and she didn’t mean a word of it.” Ms. Omar, he said, should leave the House or, at a minimum, give up her seat on a coveted committee. 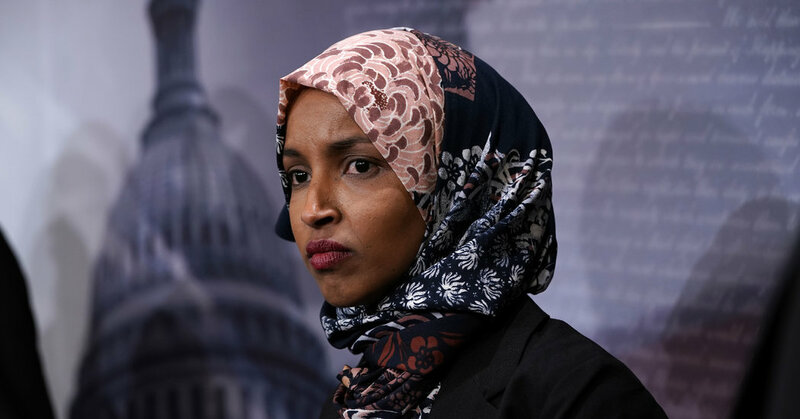 Ms. Omar issued her mea culpa after a bipartisan storm of protest over the tweets, in which she said that the United States’ support for Israel was paid for with money from a pro-Israel lobbying group. “It’s all about the Benjamins baby,” she wrote on Twitter, referring to $100 bills. Mr. Trump was the latest in a parade of Republicans and Democrats to condemn Ms. Omar. But the president himself has perpetuated stereotypes of Jews using money to buy political influence or of acting as “globalists,” pulling the levers of power for their own enrichment. In 2015, Mr. Trump told members of the Republican Jewish Coalition: “You’re not going to support me because I don’t want your money. You want to control your politicians, that’s fine.” He added with admiration that it was a roomful of “negotiators,” leading some to object afterward that he was engaging in Jewish stereotypes. Aipac is the pro-Israel lobbying group that Ms. Omar cited in her tweet when a reporter asked her who was funneling money to American politicians to secure their support for Israel.